Ever heard the expression "if you can't say anything nice, then don't say anything at all"...well, this post will be ignoring that advice. Sand Storm 913C: A reddish terracotta. Mocha-licious 914C: A reddened mocha brown. 24 Carrot Gold 969: A medium coral orange. Purty Persimmon 970: An intense reddish-orange. Coral-ine 909D: A bright coral-red. Spiked With Rum 915B: A rosy pink coco. In the Flesh 912C: A muted rosy-pink. Wine Room 906D: A muted berry pink. Cinnamon Spice 917B: A deep brick red. Cherry Bomb 918D: A deep brown based burgundy red. Sugar Plum Fairy 908C: A deep magenta. I would describe Wet N' Wild's Mega Last Lipsticks as being a few notches below okay. The formula is drying, flaky, and bleeds into every crack on the lips. Application was a nightmare when applying directly from the tube (I would recommend using a lip brush) . These lipsticks dragged and pulled, with no slip whatsoever.The Mega Last definitely requires a lip balm underneath as well as a gloss or balm on top. And the packaging, where do I begin with the packaging? Only eight letters come to mind when I think of the packaging...T.E.R.R.I.B.L.E! I had zero expectations for these lipsticks, so I can't say that I was disappointed...but I surely wasn't impressed. I do have to say, out of the 12 lipsticks, 24 Carrot Gold 969, Purty Persimmon 970, and Coral-ine 909D performed the best and were my favorites. Have you tried Wet N' Wild's Mega Last Lipsticks? We don't have Wet N' Wild either, I got these on my last trip to the states. Their eyeshadows and blushes aren't bad. I need to post swatches. I keep on buying these because I want them to work, but they never do for me really. I keep on hearing people rave about these, so I go in for another one, only to be disappointed all over again. They are way too dry for me. I like a moisturizing, glossy lippy myself. I purchased these all at once. I wish I would have just purchased one, because I wouldn't have bothered with buying any more! Bummer- these are my favorites lately! but I agree they pull a bit, but I'm a bargainista and on a no buy (not by choice) and am making them work. For now. I am shocked to see this review! These are hands down my all time favorite lipsticks. I have tried everything from the lowest quality DS to expensive HE brands & these are by far my FAVORITE. especially for $2, you just can't beat it. I guess my love is very biased since I actually HATE the feeling of wet/moist lips. I like to use more matte/dry lip balms, work them into my lips then get rid of the excess. I love these BECAUSE they are dry and matte. I haven't experienced them bleeding. the packaging is a little dinky but I mean it's $2! I wouldn't apply from the tube anyway just because they're SO pigmented. I was really bummed when these didn't perform as I had hoped. I still try to make them work, but I'm not not thrilled with them...shame. Sad you all feel this way!! Everyone is entitled to what they believe but these are some of my absolute favorite lipsticks! I get compliments all the time, and for 1.99 the price is unbelievable for the staying power and matte finish. but, i liked your review, because matte textures not are good 4 every one, and because, make people read a different opinion that the most guys. 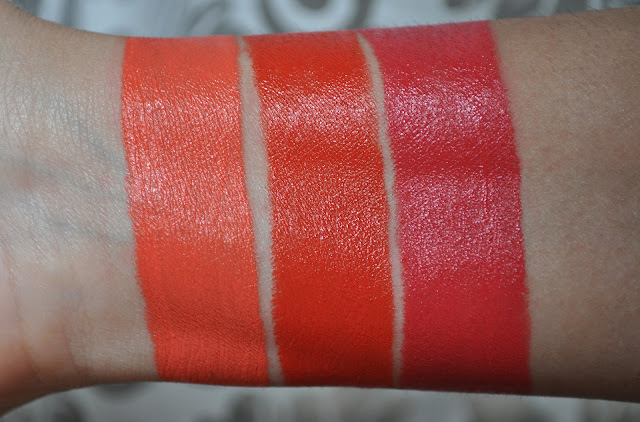 beatiful swatches, even i liked so much perssimon lipstick jeje, i hope find that in some store. love your sincere way of say thinks, and i love your blog, makes people think twice when their go shopping. beauuuutiful swatches and you are so sweet to reply to everyone! 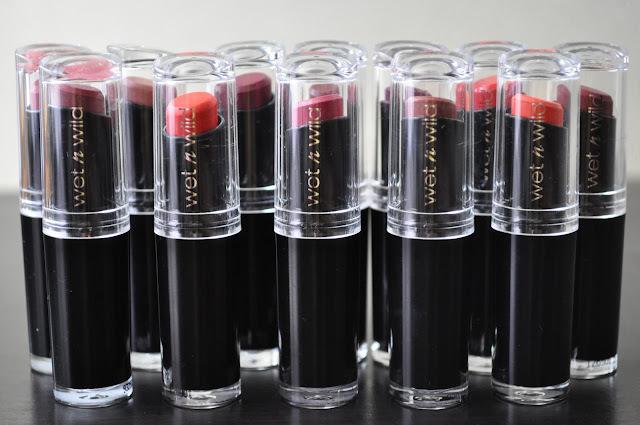 Yes, the Wet n Wild lipsticks are Matted, but that doesn't mean they should be overtly drying on the lips (and I don't mean appearance), should feather, or crack or bleed. A matte lipstick should look "dry" not BE drying on the lips. That's so weird. I feel like my megalast lippies are too creamy! They are great no matter what but I don't have them tug on my lips. Very interesting to hear your opinion. Then again I am not THAT much of a picky individual. To each there own. The one lippie I consider to be worse at drying is MAC's RubyWoo... NOW THAT'S DRYING! Some of these are creamier than other, but throughout the day, the texture of these lipstick deteriorate. In all actuality, I'm NOT a picky person. I love ALL makeup regardless of brand and price point. But when a product doesn't work of ME, I say so. And you're right, to each their own. Ruby Woo is a drying matte. I can deal with a drying lipstick. but what I can't stand is when a lipstick feathers, crack and peels, which is what happens (to me) with the Mega Lasts. I loved how you swatched the colors; it's such a good way to compare if one is a little more red or a little more pink, etc. to help decide when 2 or more colors are similar. It's a shame the formula didn't work for you; everyone's body chemistry is different. I am lucky to have no problems with these since they are so affordable. But I can understand your disappointment. I've purchased lotions that are supposed to be really good that end up actually leaving a burning or itching sensation, so I have to completely wash it off with soap. I hope you're able to find a lipstick formula that treats your lips better. I'm glad you found the swatches helpful. I REALLY wanted to love these. Actually, I'm not sure I have them anymore. Hi GREAT SWATCHES! I must say! I have reviewed Carrot gold and that is very good with application and has no bleeding issues! I think these lipsticks become drier with time and may be you got some old ones! no offense! :) If you peel the tip the lipstick before applying then it can be applied easily! These are hands down my FAVORITE drugstore lipsticks ever! Sorry you didn't like them. I really wanted to love them Olga. Total shame.